Penalty Shot Ticket Redemption Game from Andamiro is a fun arcade machine for all sports fans. 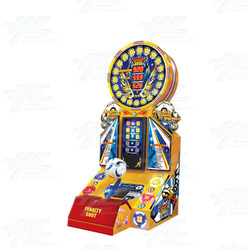 This computerized indoor kicking game machine will bring an energetic aura and compelling excitement in every location. With patent spring system on the ball holder and urethane covers, Penalty Shot promises fun and safety to all ages. Vivid displays of players scores are portrayed after each kick and when a previous high score is beat, an addition bonus play is granted to the winner. Penalty Shot is brilliantly designed with energetic colors and splendid LED lighting system that delivers an uncompromising, charismatic presence in any environment. Superb sound quality along with its attractive decor, Penalty Shot offers its players to experience a glimpse of glory where only soccer superstars display. Vivid displays of players scores are portrayed after each kick and when a previous high score is beat, an addition bonus play is granted to the winner. Penalty Shot is brilliantly designed with energetic colors and splendid LED lighting system that delivers an uncompromising, charismatic presence in any environment. Superb sound quality along with its attractive decor, Penalty Shot offers its players to experience a glimpse of glory where only soccer superstars display.